Royal Ascot is nearly here. The biggest last festival of the season and all the stars are on show. At JPW Racing Tipster we will be looking continue our excellent festival record and repeat our success at last years Royal Ascot where we made 29 points profit. The excitement is building and with 5 days of world class racing we are in for a treat. Everyone wants a piece of Royal Ascot so much so that they travel from all over the world with horses to be part of it. I am going to go through all 5 days focussing on the better races and look at some key clashes. I have also included my early NAP of the week. A very competitive race this year with Rhododendron at the head of the market. She comes into the race after winning the Lockinge Stakes at Newbury and that is the same route that Ribchester took last year when winning this race. She won’t have it easy though as we have Benbatl in the race who has been in excellent form at Meydan this season. Lightning Spear was just a short head behind Rhododendron in the Lockinge and has run well in this race before. We also have the french trained horse Recoletos who will be looking to spoil the party. Some horses at very big prices in could even get involved here. What a start this is going to be at Royal Ascot. This group 2 race has produced winners such as Canford Cliffs, Caravaggio and Dawn Approach in the past. The market are saying this is a 2 horse race between Sergei Prokofiev and Calyx. The first named is trained by Aidan O’Brien and has won his last 2 races very impressively. The last named horse Calyx was an impressive winner last week at Newmarket and the time of the last few furlongs was very fast. He has been subject to a huge gamble and this now looks to be a head to head between the two. They will both be hard to beat but have they left value elsewhere? Last years winner was Lady Aurelia and she is taken on by Battaash who on his day is as fast as they come over 5 furlongs. Who will come out on top? This is a fantastic clash and you make a case for both of them. Lady Aurelia needs to bounce back from a bad run recently and Battaash could lose the race before it even starts. If both are on their A game this has the potential to be the race of the week. The final Group race of the day and a race but looks wide open. The John Gosden trained Without Parole heads the market but he made hard work of his win at Sandown on his last start. He is sure to improve and does look classy. Tip Two Win finished 2nd in the 2000 guineas and if he was trained by one of the bigger trainers would be shorter in the market. Romanised won the 2000 guineas while US Navy Flag came home 2nd. Gustav Klimt should also like Ascot. The french are bringing over Wooton who could have his say. A very competitive race. Chelsea Cloisters is trained by Wesley Ward and he thinks alot about this horse. The trainer does well in this race but is 9/4 too short? Just Wonderful will give her a test as will the Aiden O’Brien trained Fairyland. All the rage is about Southern France who is the current favourite and trained by Aiden O’Brien but he has to step up again. Taking the favourite out of the race and it is a very competitive race with one of about 10 horses who could have a say. Cracksman is the short priced favourite and I for one wouldn’t want to take him. He looks banker material but for me it may be a race to watch. Poets Word is next best in the market and the value could be to bet without Cracksman. Lots of value around in the Royal Hunt Cup with nearly 30 runners. I already have my eye on a few at big prices but we are just waiting for the draw and if they get in or not. Another big day and we will take you through the best races of the say. A very interesting race and it all depends on who turns up and who does not really. Wild Illusion heads the market and it is easy to see why after his 2nd in the Epsom Oaks. Magic Wand who finished behind Wild Illusion has been well supported over the last few days while Lah Ti Dar will have lots of support. Sun Maiden is another horse who with have plenty of support. The market say this is a 2 horse race between Order Of St George and Stradivarius. Both deserve to be at the head of the market but I am sure Vazirabad and Torcedor will have something to say about that. A fascinating race. Who will come out on top? What a race this looks on paper and another in which you could make a case for 5 or 6 of these. Sioux Nation heads the market along wtih Equilateral but not far behind are Invincible Army, Sands Of Mail and Us Army Navy Flag. Clemmie has been well supported in recent days and has taken over as favourite from Alpha Centauri. She will need to improve on her first start of the season but is expected to do so. I am sure Irish 1000 guineas winner Alpha Centuri will be well supported as will 2000 guineas winner, Billesdon Brook. Another race with around 30 runners and if you are going to get a big priced winner it is likely to be in a race like this. Highly competitive and can’t be that confident in races like this as you need a lot of luck. Crystal Ocean is the short price favourite here at 2/1. The next best is 10/1 so plenty of value around. He will be very hard to beat but plenty will test him. What a race with Harry Angel, Merchant Navy, Redkirk Warrior, The Tin Man. The list goes on. Harry Angel deserves to be favourite but has stiff competition. A race I am very much looking forward to. As things stand and at the current prices my NAP is HARRY ANGEL at 11/4 NRNB with Betfred or 5/2 with Sky Bet. He does have stiff competition with Merchant Navy and Redkirk Warrior but I simply think he is in a different league to everything else. He has only had 1 start this season which was an easy enough win at York in the Logistic Stakes. Clive Cox has trained him specifically with this race in mind and with the weather ok for the next 10 days he is going to get lvoely ground. I make him 7/4 favourite at the time of writing (14th June) which makes the 11/4 or 5/2 on offer look big. 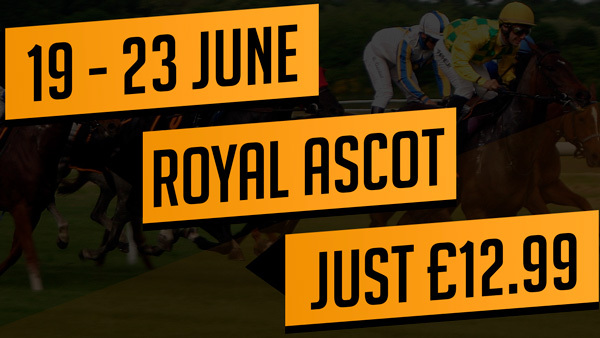 We will be running our usual Royal Ascot Festival Special for £12.99. That covers you for 5 days of tips. All out tips come with full in depth analysis. Our festival record is unrivalled in the industry and over the last 3 years we are 50 out of 60 festivals in profit. Last year we made 29 points profit at Royal Ascot and we look to build on that profit this year. We are going into Royal Ascot in the form of our lives and confidence is on an all time high. Want to receive tips for all five days throughout the Festival? Sign up below for just £12.99!